The Nanny Joynt is working with a warm and welcoming family with two active children! Their youngest child is 10 months old, he is a very happy baby who loves his Mom and is very easy going. His older sister is 3 years old and attends preschool a few days each week. She is very sweet, intelligent and outgoing. She enjoys dance, gymnastics and swimming. This family is seeking a professional, proactive, and organized nanny to join their family! Both parents work outside of the home, however, either Mom or Dad can be in and out during the day, or working at home on occasion. They have some flexibility for the hours on Tues/Thurs and are open to working out a schedule that works best for their nanny on those days. They are open to guaranteeing 40 hours per week for the right nanny!! This position is offering $18 per hour, 4 weeks off per year paid and guaranteed hours! This position requires reliability and the ability to work even if one of the children should happen to be sick. This family is seeking a “Mary Poppins” type nanny who will be active and engaging with the children. For the time being this family requests that their nanny be ok being at home with the children as they are not yet comfortable with them being driven by another person at this time. The ideal candidate for this position will be engaging, committed, loyal, loving and flexible. You should be efficient and effective at multitasking, a true team player happy to pitch in whenever and wherever help is needed. Child related duties will include, but is not limited to: All things related to childcare, feeding, diapers, cleaning up children’s areas, organizing, helping the children meet each developmental milestone, engaging them with activities, baking, crafts, playtime, reading, educational activities, cleaning up after self and children. Outings to fun activities. Household/personal assistant responsibilities will include laundry, loading and unloading the dishwasher, organizational projects, light house cleaning and tidying, simple light meal prep, some pet care. This family does have 2 small indoor dogs. Some pet care may be needed during the day. Letting the dogs in and out, feeding and giving them water. The family would love their nanny to have an Early Childhood Education background, although, not required. A nanny who really has a great imagination, lots of patience and really will get down and play with their children is ideal. A nanny who is experienced with Love and Logic or will read up on this would be great! They are seeking at least a one year commitment, but ideally they are seeking a long term commitment and would love to have their nanny feel like part of the family! Nannies this is a fabulous job for the right candidate who is reliable, fun, upbeat and loves to play with children! This is a wonderful family who is looking for a long term career nanny to join them in raising their kids. They are respectful, flexible and will treat their nanny like family! They are excited to meet a new nanny who can be a great help and make a lasting connection with their little ones. 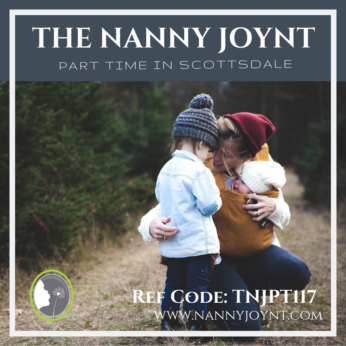 If you possess all the qualities above and are ready to work with a really wonderful family please send your resume to trisha@nannyjoynt.com REF CODE TNJPT117!